Its a hostel worth staying at. Though I wasn't there but for few hours I can speak specifically to room's cleanliness. Very nice bathrooms and bedrooms. Upon arrival, the lady at the reception offered us a double room instead of a dorm for the same price. That was very friendly. The room and bathroom were quite small, but had everything we needed. The bed was very comfortable and clean. Breakfast was basic, but sufficient since it was included in the price. Pretty cool hostel, good location, clean bathrooms and sheets. The room was the smallest i have ever stayed. Three beds, locker and bathroom. No table and chairs. Not enough place to all 3 people stand up at the same time. No elevator. 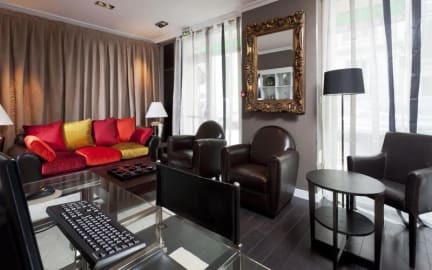 However its location is close to metro station and orly airport shuttle (orlybus). Overall pretty good, the location was great. Close to metro and shops. There were a lot of cafes and restaurants near by, as well as supermarkets. The 4 person room is really tight, it’s managebale but not a lot of room for everyone. I was disappointed with the breakfast as it was only bread, jam and butter. The common area also could have been more inviting so that people could meet and mingle better. Pretty good value for money. The staff could not be any more disinterested in their work at the hostel. My sheets were dirty, I had hair in my bed. It’s hard to sleep as the bunkbeds are not stable at all and as you turn the other person sleeping above or underneath you wakes up. You hear every noise in the hostel. The breakfast was VERY simple. Baguette, butter and Marmelade. The only positive thing about this hostel, is that it's close to the train station which is useful for early starts. The hostel got our booking mixed up so even though we had booked 2 beds in a mixed dorm, we were moved to separate rooms. The rooms are really small , the lockers didn't close so they couldnt be locked they guy working just shrugged his shoulders. We were told there was breakfast from 7, came down at 7:30 no breakfast and the guy working was snoring on the sofa. Nice. The bed was very small and narrow, breakfast was literally just bread and jam, stuff not really pleasant and helpful.